Looking back 40, 30 and 20 years ago, the following are excerpts from the Artesia Daily Press from Dec. 24-30. Six Lake Arthur babies will be celebrating their first Christmas this year. They are John Travis, son of Mr. and Mrs. Pat Havener; Jennifer, daughter of Mr. and Mrs. Lewis Needham; Amy, daughter of Mr. and Mrs. Calvin Malcolm; Misty, daughter of Mr. and Mrs. Jimmy Adams; Robbie Lynn, son of Mr. and Mrs. Robbie Robinson; and Carey, daughter of Mr. and Mrs. Dan Salzwedel. By virtue of it being Christmas, Judge Donald Price Saturday ordered the release of the four men occupying the city jail so they could enjoy the holidays, too. All four men, two of them in for driving while intoxicated and two for driving on revocation, were released at 6 a.m. Dec. 25 and told to be back to continue serving their sentences on Dec. 27. Most of them are in on 90-day sentences. Robert C. Bartlett, a driver for Steere Tank Lines, was selected by the New Mexico Motor Carriers Association as the driver of the month for January 1977. In his 19 years of service, Bartlett has accumulated 1,614,000 accident-free miles. He and his wife, Connie, reside in Artesia. As reported in the Pinon News: Mr. and Mrs. Henry Jackson from Las Cruces were guests in the home of their son, Jackie, and family over the weekend and attended services of the Church of Christ here Sunday. The Jackie Jackson family live in the Don Merritt ranch house just across Pinon Draw. The Henry Jacksons were residents of this community at the time of their marriage in the 1930’s, so they are well known in this area by the old timers. Mrs. Jackson is the former Mary Cole Merritt, sister of Don and Jack Merritt, ranchers of this area. The Merritt families have been ranchers of this are for some 40 or 50 years. Don Lane from James Canyon was at his ranch in the Avis area Saturday pumping water for his cattle. He plans in the very near future to make improvements on the ranch. 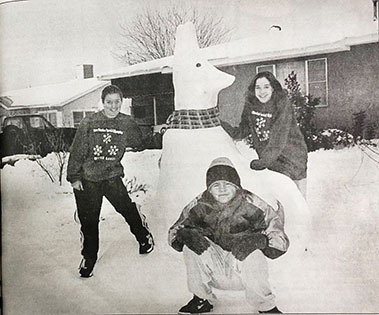 As reported in the Lake Arthur News: Gina Funk, Ricky Robinson, Roy Merworth, Ernie Soto and Mike Aguirre sponsored a ninth grade Christmas party Dec. 17. The party was held at the Robinson “big house” in Lake Arthur. Guest brought records of their choice. The party was held on the third floor with decorations of tinsel and decorations of tinsel and mistletoe. Approximately 25 persons attended the party. Before dismissal of school for the holidays the entire junior high and high school were treated to free popcorn and cokes as a pre-Christmas treat. Artesia residents will have the opportunity to hear the Park Junior High School band perform its honor concert. The band was selected as the 1988 New Mexico Honor Band and will travel to Albuquerque Jan. 7 to perform for the New Mexico Music Educators Association. As reported in the Pinon News: It rained here most of Thursday night and it was quite warm so that it melted a lot of the snow and water was running everywhere for which the ranchers were quite happy, as it was so dry before the snow fell. Thirty inches of snow was reported in the Weed and Sacramento areas, twenty four at Avis and eighteen at Pinon. There was one night the temperature dropped to five below zero in the Avis and surrounding areas. Nearly every person in the area reported they were glad there was only one very cold night. Mrs. Oza Holcomb spent much of the time of the storm renewing some of her mother’s furniture, two pieces that her mother, Mrs. Edith Atkins, had had in her home for nearly 80 years. It is amazing what some hard work can do. The pieces are beautiful after being repaired, being stripped of old paint and varnish, sanded and revarnishing and new or cleaned and polished drawer pulls, especially the old pulls. They are such beautiful patterns that aren’t made now. Dear Santa: Hi, my name is Dalaci and I am 10 years old. I have been a super good girl this past year and I was wondering if maybe you would bring me a Hanson C.C. and Spice girls and a 10 speed bike and whatever else you want to bring me. Remember my brother Laramie and Brianna for Christmas. Love you Santa, Dalaci. As reported in the Pinon News: Mrs. Oza Holcomb had letters for the Ernest Strang family in Arkansas, wanting them to write from the Strangs of this area. They want them to meet them in Lavaca, Ark., at the old home place for Christmas, where they all plan to meet. All the older Strangs of this area have been dead the past several years and the oldest ones left are getting old enough or have other problems and need to remain at home. Top play by twins Jeannine and Kandice White Monday led the Artesia High School girls’ basketball team to a win over Goddard and a chance to play in the championship today in the Goddard Invitational. Jeannine scored 20 points, including one three-pointer, and Kandice racked up 19 with three three’s for the Lady ‘Dogs in the 52-45 win over Goddard. Park Junior High School cheerleaders Nikki Jones and Kristen Young prepared to perform in the pre-game show at the Outback Bowl in Tampa, Fla., on Jan. 1. They were part of an NSG Performance Team presentation at the bowl game. The two Artesia cheerleaders were picked from a group of 250 girls at a camp they attended in Las Cruces in June.